Remotely updated digital labels with information and prices. 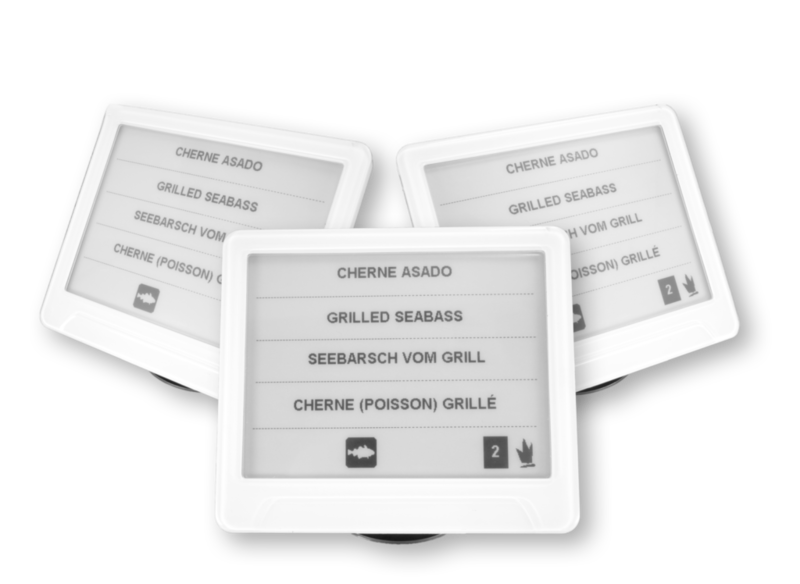 Interactive Digital Tags are small labels with electronic ink screen and battery powered. The battery lasts several years and they are equipped with radio frequency communication. Thus you are able to update the content and show personalized information of each product. The content and information of these labels is highly customizable and can be updated from any computer, in real time and / or programmed automatically. Reduce the time that the staff uses to update the information and price labels, with the corresponding economic savings that this entails. You can add any type of descriptive content, such as the product price and its variations, promotions and / or any other data. 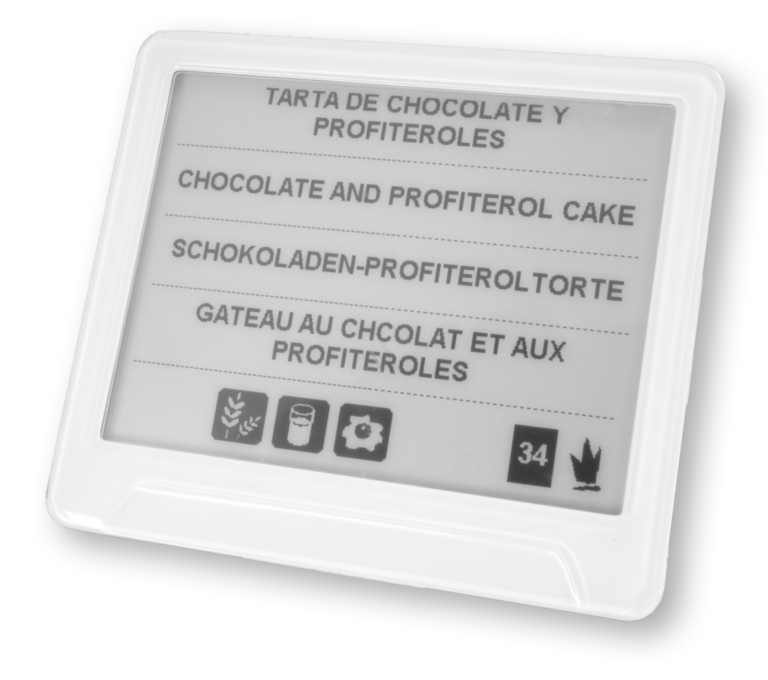 The electronic shelf labels have an 180º angle of view and working temperature from -20º to 50º. 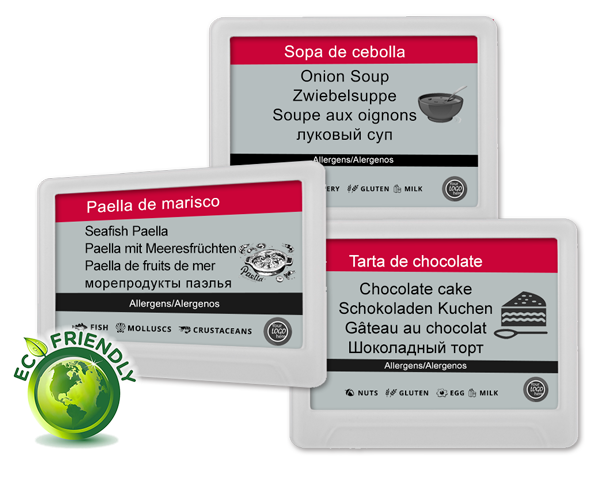 Used in the hotel restaurants, the electronic labels will inform their diners of ingredients and allergens contained in each of your dishes. At the same time you are able to update the descriptive content in an automated way. Used in large areas with a wide variety of products, they will help you to save management and material expenses, all electronic tags can be updated together from a single device. Screen: EPD anti-glare technology, available in monochrome and various colors. Find answers to all your questions about our digital electronic tags. Do they turn off if I unplug the PC? The shelf labels only communicate with the PC to update data and information, once updated they do not require a connection to the PC. What coverage do they have? The tags work on a frequency similar to WiFi, its range can vary between 164 and 328 ft. You can install several antennas to increase your coverage. The electronic labels have almost an energy consumption of zero, when they are in standby. Their highest consumption is during update. When they are in standby mode, the image on the screen continues to be displayed normally. The duration of your battery can reach up to 5 years depending on its use. Can I program the information? Yes, the label management software allows you to program the labels so that they show different information according to the day or time. Can I synchronize the prices with my management software? Is it dificult to change a label manually? Find answers to your questions before buying our digital electronic labels. Can I get the tags in renting (leasing)? Yes, it is also the option that is best accepted among our customers. Through a 36-month lease, we can include in one single fee the cost of everything you need to enjoy your electronic labels. We renew the renting for another 36 months under the same conditions, changing the digital labels for more modern and current ones. We renegotiate the contract by adjusting the monthly fee for a more affordable one and keep the current tags.